Interested in supporting small businesses? Check out UCLA Staff Assembly’s Small Business Resource Fair on Thursday, Jan. 31 in the John Wooden Center’s Collins Court. A wide array of small business vendors will be available to discuss their products and services with campus customers from 11 a.m. to 2 p.m. 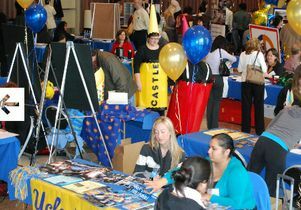 The annual fair is one of UCLA’s ways of supporting the development and growth of businesses. Participation in the fair provides small business owners with an opportunity to reach more than 400 UCLA departments that purchase in excess of $250 million in products and services each year. The fair is also is an opportunity for departments receiving federally funded contracts to fulfill their commitments for outreach to small businesses. The event will be catered to address a broad range of products and services for departmental needs like biotech and labs, food and party supplies, office supplies, tech startups, facilities and transportation and more. BruinCards are required to enter the fair and faculty and staff are encouraged to bring business cards to participate in raffles.